Real Betis boss Quique Setien has his side playing some great football, and it appears as though he has a fan in Barcelona midfielder Sergio Busquets. Although they currently sit in a lowly 12th place in the La Liga table, it would be a surprise to see them not climb the standings in the coming months. Their 4-3 win over Barcelona on Sunday showed the level that they’re capable of performing at, and it seemingly appears to be a case of finding that quality on a consistent basis. While for those who have watched them this season, it comes as no surprise that Busquets appreciates their style of football which sees Setien make the most of the creative and technically gifted players at his disposal with a possession-based game. 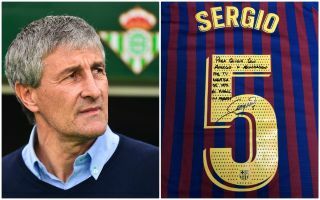 As seen in the photo below, the Barcelona stalwart sent his jersey to Setien after the game, and it had a personal message for him written on the back. “For Quique with appreciation and admiration for your way of seeing football. A hug,” as noted by Mundo Deportivo. Despite the setback, Ernesto Valverde remains on course to follow up on his successful first season in charge at Barcelona. However, if there comes a time when the Catalan giants are considering a replacement, it’s difficult to not see Setien being amongst the candidates given how his style of management and preferred brand of football appears to fit perfectly with that of Barcelona.